The BCW Nursery Tag is a mineral reinforced polypropylene thermal transfer tag with durability, strength, moisture and chemical resistance. An economical option for outdoor tags, it is recommended for nursery, lumber and outdoor storage applications. Use with BCW Wax/Resin ribbon. 1.00" x 10.00", 4 across deluxe polyolefin thermal transfer tag on a 3" x 8" core. 1920 tags per roll / 4 rolls per case. 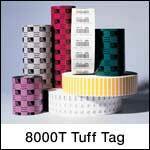 BCW 2385620 Tuff Tag special features - Perforated. Use with BCW Wax/Resin ribbon. 1.00" x 10.00", 4-across, polyolefin thermal transfer tag on a 3" x 8" core. 1920 labels per roll / 4 rolls per case. Zebra 69531 special features - Perforated. Use with wax/resin ribbon.